Seven year old Millie Bird has been abandoned by her mum in a department store. She sneaks to the cafeteria where she makes friends with eighty-seven year old Karl the Touch Typist. When Millie is found under the underwear rack by the department store workers, Karl creates a diversion so she can escape. She returns home to find it empty, and the eighty-two year old woman across the street, Agatha Pantha, watching her. Agatha gives up her self-imposed life as a hermit to help the little girl travel to Melbourne in search of her Mum. But Karl has escaped from the old folks home and wants to help Millie too. So the three of them go on an adventure across Australia together. Along the way, Millie learns that old people don’t always know best, and the old couple learn that being old isn’t the same as being dead, and to look for the enjoyment in life, before they lose it. They look at each other and smile. They’re actually going to make it. This book touches on some heavy issues such as grief, abandonment, and growing old. This book is unique in that it has a very young and two very old protagonists. 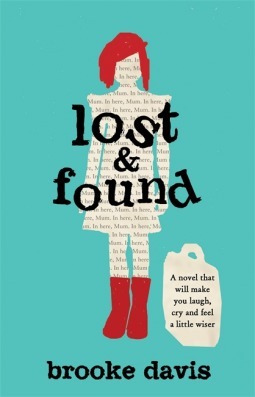 There are plenty of humorous moments throughout Lost & Found that you fall in love with all three of the point of view characters — even Agatha who admits she’s not very nice. I actually found myself laughing out loud at a few of the events that occurred, especially those surrounding Karl. My husband kept asking me what was so funny. The ending threw me for a loop. I would have liked to have known exactly how the journey to Melbourne ended. But since the whole book was about death, it seemed only fitting that we learned how each of the main characters died, even if we didn’t get all the details. My only little quibble with this book was the use of italics for speech. I’m not sure why the decision was made to forgo the traditional use of speech marks, and I hate to say it, but it did bother me. Italics aside, this was an excellent read and I highly recommend it.